Finding a perfect pair of running shoes can be a difficult chore. It can be really overwhelming to choose one from the array of shoes available in the market. All of them look almost the same. However, you must know that every pair of running shoes is not designed equally. They differ widely by brands and materials. Unless you can select the right pair of shoes, you may have to compromise with your running speed and even your back and joints. Choosing the right shoes can really make the difference. Here are some useful tips which can help you pick up a right pair of running shoes that would have you running like a marathoner.• Check the soles of old shoes – You can check the soles of your old shoes. Check the spots on the bottom on your old shoes. It would help you detect the area where your foot falls whenever it touches the ground.• Place the shoes side by side – Now place your chosen shoes side by side on the ground or any flat surface. It they tilt in towards the middle, they may need more stability than the old pair. But if they tilt towards outside, you would have a high arch and the new pair must have good shock absorption capacity.• Check top of the shoes – Now you check the top of new shoes. If you find any outline of the big or little toe, and/or you feel any sort of uneasiness in those spots while running, you must go for a wider or larger pair. • Decide on the amount of running – Consider the length of running. This is an important step towards deciding whether you should go for a pair of elite running shoes or a pair of basic running shoes. You may need to spend money depending on the intensity and frequency of running.• Find a good store – There are many retailers of running shoes, for example Puma. 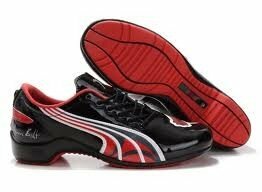 You can find Puma shoes in different designs. You may get your pair of running shoes at a Puma outlet. However, such shoes are also retained by local shoe stores. You may ask your friends who run regularly to recommend a store. Local magazine reviews and Yellow Pages would also help you locate a reputed shoe store in your locality. Visit the store and ask the salesperson to help you choose the perfect shoes. You should tell him about the difficulties you have found about your old pair of shoes. You can also bring the pair with you. However, he should be enough competent and skilled to check, rather ‘read’ the shoes and guide you accordingly. If he can’t, then you should look for another store.• Try on the shoes – As the next step, you need to try on your chosen pairs of shoes. Most shoe stores allow buyers to run up and down the road to check the shoes. Try them and pick out the pair that provides you maximum comfort and speed. Try on the shoes for a minimum of 10 minutes. Otherwise, you can’t find its comfort level.Purchase the best quality running shoes for your feet. If you get the right pair, you can definitely run like a professional athlete. Author’s Bio – Mary James is a reputed lifestyle and sports blogger. Her write-ups on topics like Puma shoes in different designs, choosing the right pair of barefoot shoes are widely read by Internet-savvy sportspeople.